Inbound from Brunsbuttel in Germany, the coaster APOLLO CONDOR was seen on Thursday afternoon approaching the Whiteforland Buoy, with Clyde Marine's Kilcreggan ferry SEABUS in the background heading for Gourock Pier. 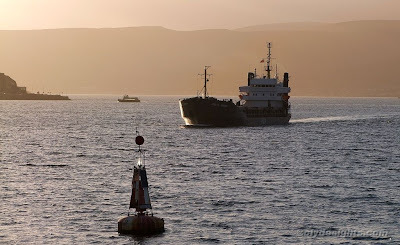 Apollo Shipping vessels - 'Condor' is one of four similar ships - are regular visitors to Glasgow where they discharge cargoes of cement, although in the past couple of months they have not been seen so often as before. thanks for the constant updates. Love this blog.